I’m sick at the moment. I have a cold or flu or some kind of bug that makes human existence temporarily miserable. It’s probably my immune system kicking me in the backside for eating all that garbage lately. So today is soup day. Very easy delicious soup day. 1. In a large pot heat the oil until shiny, then turn to medium low. Add the onion, garlic, cumin, kosher salt, cinnamon, allspice, pepper, and cayenne and stir often until the onion has softened. About 3 to 4 minutes. 2. In a food processor puree the beans and tomatoes. Add the puree, pumpkin and broth to the pot. 3. Simmer uncovered until thick, stirring often while scraping the bottom, about 30 minutes or until desired thickness. Salt to taste and garnish as desired. Adapted from Home Made Simple and Cathy’s Blog Noble Pig. Picture by Laura Flowers. ...or you were exposed to someone who was contaigeous :-). I hope the soup made you feel better. It sounds delicious. Keep the pumpkin recipes coming. This looks delicious! Hope you feel better soon. I had a major candy hangover on Monday. I hope your soup helps you on your way to feeling better. Why is it we can never make something as good as our parents or grandparents? Maybe our memories are bigger than the soup we are eating so to speak. Who knows. Hi Laura, I hope you are feeling better, did you get your flu shoot? This pic looks awesome. Get well soon, Laura! I like pumpkin soup but it often seems to be missing some oomph. The addition of black beans would certainly solve that issue. I'll have to try this soon. Sorry to hear that your sick. I hope this beautiful soup help you fight the "bug". What a great idea - the recipe does sound so healthy - seems like it has a lot of flavour and fiber too! Get better soon okay?! Beautiful soup. Somehow soup really does warm the soul and feed the body. Get well soon. Black bean soup is a favorite of mine... love that you added pumpkin (I have some in the fridge). Hope you feel better very soon. If you were here, I'd make you my Italian Chicken Noodle Soup!! 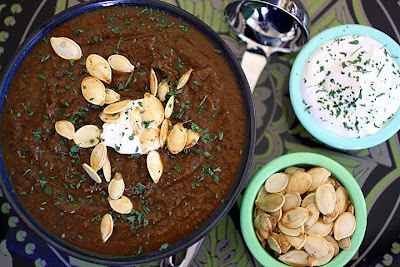 Yum, yum, yum...I've seen several posts for Pumpkin Black Bean soup lately. Must be someone telling me I need to make some :) Thanks for the super-easy recipe! I hope you are feeling better by now. Soup always helps! This is such an interesting combo with a few of my favorite ingredients. I'm adding it to my cold weather foods list. Make a printer friendly version of this page please! You got it Ted! Thanks for asking.